Want to spice up your garden? Make it interesting and creative? Adding a garden path is one way to make it happen, a fountain or pond is another. Pathways in the garden connect and tie the landscape together. You don’t need a pro for the ideas, the installation or feel pressured to impress anyone. You can use brick, which helps add character to your garden. Wood, tiles, stone, or mosaic create a special magical feel. It is up to your creative design. Learn low-maintenance, and inexpensive ways to create the garden path of your dreams. Whether you are wishing to enhance and transform your yard, or simply just make your plants more accessible. These 17 smart garden path ideas using a variety of materials help you effectively balance aesthetics, functionality and visualize your new garden walk. 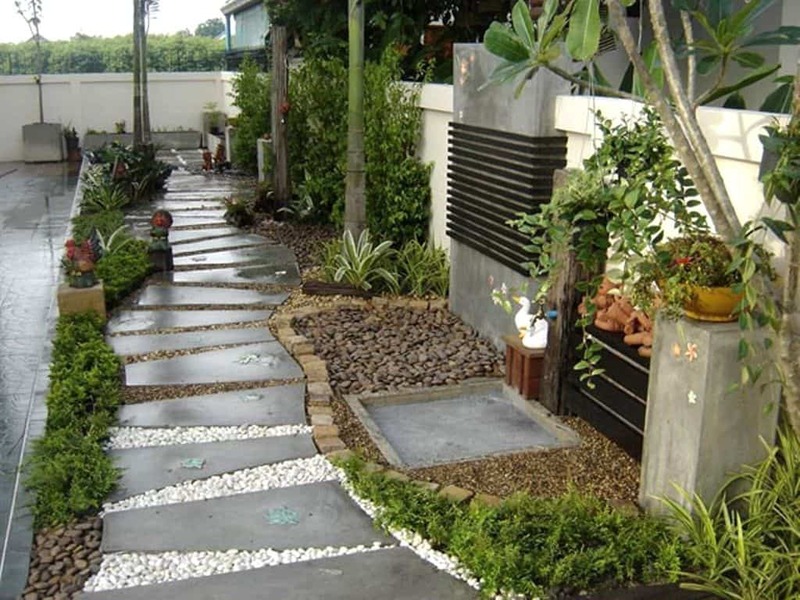 A very modern garden path made with large what appears concrete “stones” mixed with different color stone between and along each slab. A modern feel and up to date, yet also in touch with nature. Filling in the cracks of the steps with stones is an easy way to bring a lot of appeal to your garden. The moss creeping into the walkway is a nice touch. The stacked stone along this garden path looks like a continuation of the walkway. It pulls the small stone retaining wall and path together seamlessly. It all creates a very aesthetically-pleasing view for the eye. This simple garden path idea uses old wood to create the walkway. Soil and mulch surrounds the path leading you to a grassy area providing a sense of direction. The spiral patterns in this walkway make it a one-of-a-kind eye catcher. It takes a lot of work, but as you can see, it clearly pays off. The moss between the stones create a very natural feel, as though it’s been growing that way for decades. The fountain ties everything together beautifully. A garden path “assembled” with very large stones requiring heavy equipment to install. The stone walkway surrounded by beautiful interesting vegetation makes you want to stop on your way to the front door. A path which makes you feel like you’re home already. Lots of curb appeal! Nice simple, clean looking garden path with white squares surrounded by dark gray rocks. It fits in a narrow space perfectly between two buildings. One side with short plantings the other with taller bamboo. This is a very creative use of brick as a walkway. It’s inviting, yet casual and brings a lot of color to an otherwise normal garden. 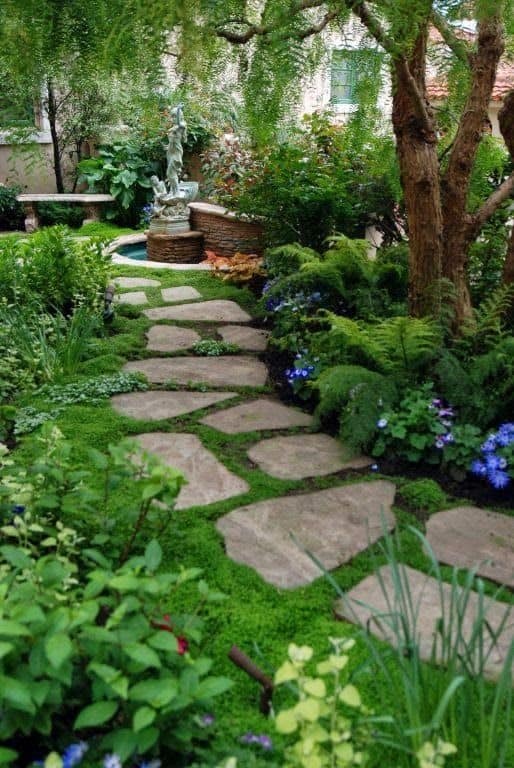 Another of these garden path ideas mixes a beautiful color scheme but transitions with textures in the stone and rock surrounding and very minimal plantings. The path makes you feel as if you’re in nature but not totally abandoned. An inviting forestlike landscape surrounds you in greens and browns, accented by flagstone steps that form a striking path and stepping stones down a shallow slope. The dark green Aspidistra planted along the walkway edge adds a richness to the area. This shows off how to have an aesthetically pleasing garden bed. The natural walkway is a perfect accent that makes it feel like you’re really walking through a forest. The crushed rock provides a “crunch” with each step! This is about as close to a completely natural walkway as you can get. Adding the wood slats to the mulch ensures that you always have proper footing on your walk through the garden. The garden lighting adds a safety factor for evening walks. The garden path shows how you can bring your own style to the path. 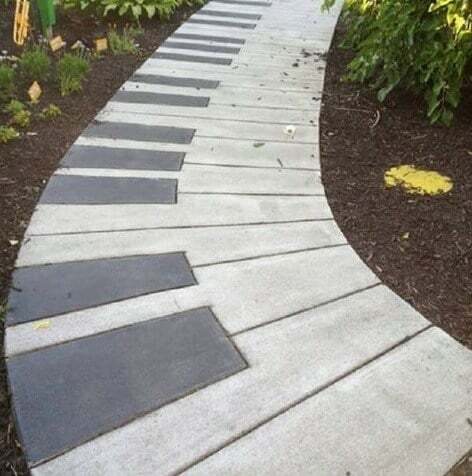 This it isn’t just an ordinary garden path, but a a replica of piano keys. A very minimal garden path made with pavers which look like wood. Surrounding the path are smaller rocks and edging. This path makes you feel serenity and balance in all things. 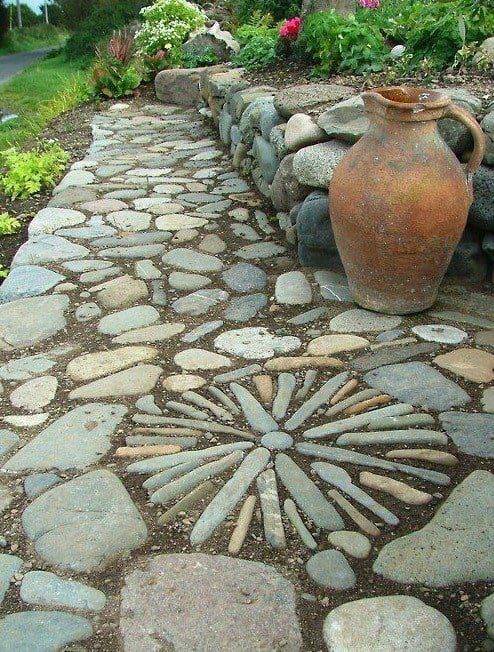 The circle pattern made by the stones adds a great way to spice up an otherwise traditional walkway. A perfect way to interupt the eyes as you walk through the garden. A great way to implement stairs for elevation while still having a natural stone walkway. The large rocks on either side create a definite placement of the stairs. A garden lined a long a red stone cobble path which leads into a entrance the exit of the path. It says to the visitor… this garden is old and you’ll find special, personal plantings.